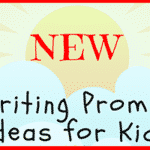 365 Writing Prompts for 8 – 12 Year Old Kids— This exciting new list of 365 prompts will take kids through an entire year of fun, reflective journaling! Throughout the year, kids will enjoy answering imaginative questions about the universe, history, and new possibilities. 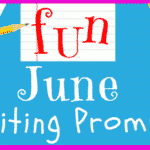 All the kids writing ideas in this series are sorted by month and are a mix of creative, fun, and inspirational writing prompts written especially for young writers. For kids who are growing up and learning to express their thoughts, daily journaling provides a safe and open environment for exploration. Journaling offers kids the chance to reflect on their lives closely—something that they might not stop to do otherwise. When kids journal, they slow down a bit and think about the people, situations, and influences in their lives that impact them the most. Writing is an outlet for our innermost thoughts and emotions—and through the process of journaling, we can better understand where our feelings originate. Children who journal grow more comfortable with expressing their ideas and opinions, and they are more confident in their own identities. They’ll grow emotionally as they reflect on moral prompts about their own belief systems, the importance of charity, and friendship. And, of course, they’ll also spend plenty of time getting to know themselves as they think about their favorite activities, people, and times of the year. 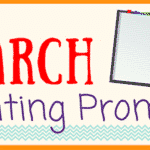 With a prompt for every day, kids will be regular writers and confident in expressing their ideas by the end of the year! 1. What benefits do you receive when you help someone else? 2. Write a poem about yourself. 3. If you could set a world record, what would it be for? Why? 4. What is the best way to make new friends? 1. What does it mean to be successful? 2. How does writing make you feel? 3. Write a poem about getting older. 4. What is your favorite sport? Are you good at it? 1. Create your own holiday. What would you celebrate? How could you get others to join in the fun? 2. Would you rather hang out by yourself after school or with friends? 3. If you could end any one problem in the world, what would it be? Why? 4. What does it feel like to be wrong? 1. Would you rather eat ice cream or cake? Why? 2. Write about a song that reminds you of something or someone special. Why did you choose the song? 3. Imagine taking a trip on a hot air balloon. Where would you go? 4. 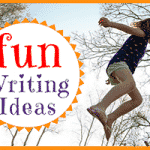 Write a poem about being a kid. 1. Who was the first friend you ever made? Why do you two get along? 2. What would be the worst job to have? Why? 3. What is your greatest wish? Do you think it will ever come true? 4. Write a poem about swing sets. 1. If you could visit anywhere in the world, where would you go? 2. Write about a person whom you’d like to be like someday. What is special about this person? 3. Who is someone whom you can always count on? How do you know you can trust this person? 4. If you were in the circus, what role would you have? 1. If you were a toy, what kind would you be? Why? 2. How is your life different today than when your parents were kids? 3. What is the most valuable thing you own? Why is it so special? 4. What is the most important quality for the President of the United States to have? 1. Write about a time when your first impression of someone changed after you got to know him or her. 2. Write a poem about laughter. 3. What is the coolest family trip you ever went on? What was the most memorable part? 4. Are you good at remembering to do your chores and your homework? How do you remember things? 1. Write about a time when you were afraid that you would fail at something. How did you conquer your fear? 2. Do you think that humans will ever travel to another planet? Why or why not? 3. Write a poem about your grandparents. 4. Do you believe time travel is possible? 1. Write a poem about outer space. 2. What is the coolest type of technological device available today? What do you like about it? 3. Write about your bedroom. What’s in it? How does it make you feel? Does it reflect your personality? 4. What is the most important lesson you have ever learned? 1. What is it that makes you who you are? 2. Would you rather dance or sing? What type of performances do you like to give? 3. Write about a time when you were trusted to do something important. How did you handle it? 4. What is the best party you ever went to? What made it so special? 1. Write a poem about happiness and how it feels. 2. Would you rather play basketball or football? Which sport is better suited to your talents? 3. Write about the best Christmas you ever had. 4. What is the hardest thing you’ve ever had to do? How did you accomplish it? 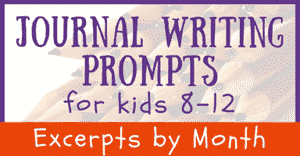 I hope you enjoyed this sampling of journal prompts. Remember, 365 prompts will be published throughout 2013.
please share them on Facebook, Twitter, and/or Pinterest.